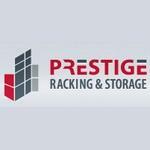 Prestige Racking & Storage is an industrial cabinetry and shelving company in Ottawa, ON. Prestige specializes in industrial racking, commercial shelving, and custom storage solutions. Ron Bednarz is the President of Prestige Racking & Storage. Products Carried: Prestige Racking & Storage offers industrial racking, commercial shelving, and custom storage solutions in Ottawa, Ontario. They are the premier racking, shelving, and warehouse design company in Canada offering Commercial, Industrial, and Institutional Mezzanines, Racking, and Shelving Solutions. Whether businesses are looking for simple storage, inventory,or improving product flow, Prestige Racking & Storage introduces quantifiable solutions to increase efficiency and save money.